This C program actually simulates the stack operations graphically and in text mode. User can Add, Delete, Search, and Replace the elements from the stack. It also checks for Overflow/Underflow and returns user friendly errors. 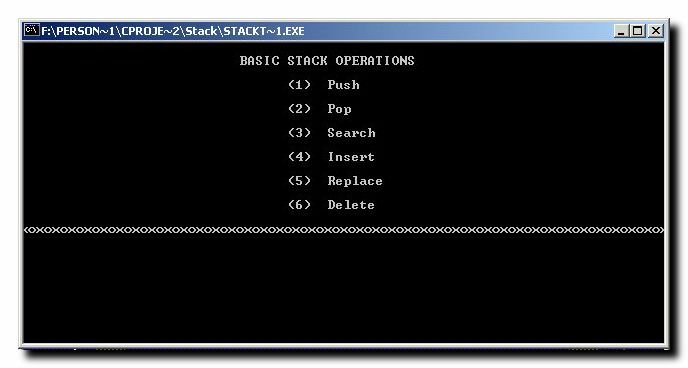 You can use this stack implementation to perform many useful functions. In graphical mode, this C program displays a startup message and a nice graphic to welcome the user. Add: Pushes an element to the stack. It takes an integer element as argument. If the stack is full then error is returned. Delete: Pop an element from the stack. If the stack is empty then error is returned. Th element is deleted from the top of the stack. Search: This function takes an integer element as an argument and returns the location on the element. If number is not found then 0 is returned. Replace: This function takes two integers as arguments, first number is to find and second is to replace with. It first performs the search operation the replaces the integers.